View videos (video 1 and video 2) about our program, read about it, and download our printable brochure. 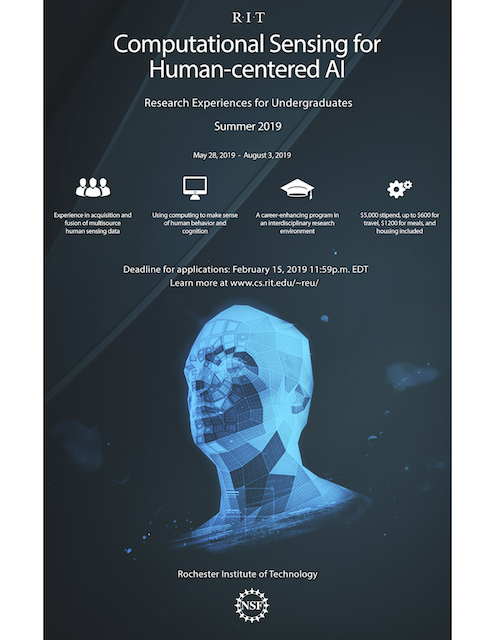 The REU Site in Computational Sensing for Human-centered Artificial Intelligence recognizes that as the boundaries between HCI and AI blur, and AI grows increasingly agile and pervasive, the next generation of computational scientists must be capable of responsibly and effectively leveraging a spectrum of sensing data from data-generating humans. With this focus, the REU Site will expand its trajectory as an attractor for highly diverse students who will gain experience with sensing hardware and software towards transformative advances in intelligent systems focused on human behaviors and cognitive processes. Enabling diverse stakeholders early in their careers to discover how to collect, fuse, make inference with, and visualize multimodal human data can transform how humans and machines engage and collaborate. The research in the REU Site will address two limitations in AI: first, that underserved populations are at risk of being marginalized with the present focus on big data AI and, second, that AI trainees often lack experience with human data collection and critical thinking about human-elicited datasets. The REU Site will stimulate novel, safe ways for systems to team up with people to address society's vexing problems while remaining fair, attuned to bias, and representative of the diverse fabric of the general population. We link these objectives to four associated Site aims: (a) to offer team-based research with real-world problems that emphasize social good and impact; (b) to cost-effectively enable global awareness and skills-building, by facilitating on-campus international cultural exchange for REU cohorts; (c) to provide outreach enrichment for cohorts to learn how to communicate research broadly; and (d) to disseminate lessons learned from the REU Site to the scientific community. This material is based upon work supported by the National Science Foundation under Award No. IIS‐1559889 and CNS-1851591.